After a hard day of conventioning (yeah, all four hours and one panel of it), I needed to get out and hit the night life! 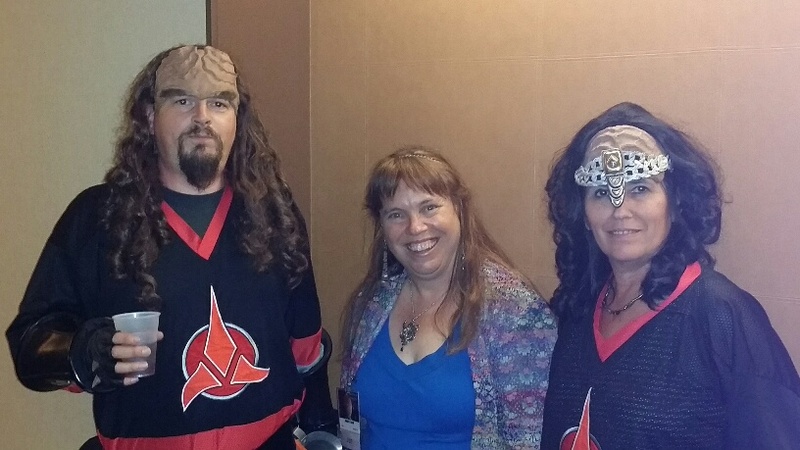 What better place than a SF/fantasy con, because really, who else knows how to party like Klingons? 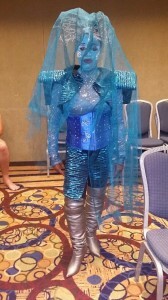 Mellow Klingons? I’ll have what they’re having! But I wasn’t after the free booze…I was after something more. Trophies of my con experience. I was after RIBBONS! Ribbons are a new part of the con game from when I dropped out of the circuit. They are a great way to meet people and spread the word about what you are doing and interested in. Shoot, I’m gonna get the super-size ribbon when I get In a Mortal Shadow out the door! They also appeal to me on a baser plane…she who has the most ribbons WINS! 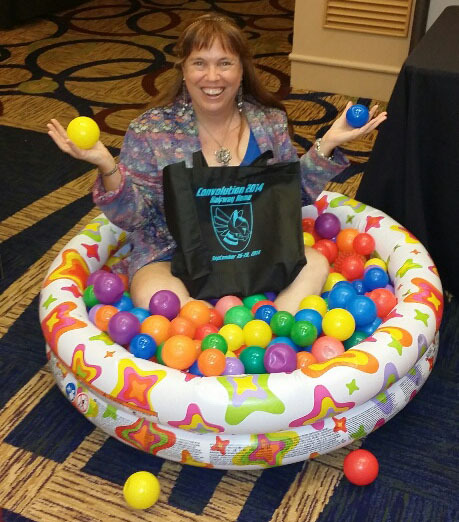 I didn’t win at Westercon; I didn’t win at Con-Volution 2013; I didn’t win at BayCon. But Convolution 2014, well that was going to be all mine. I was going to take home more ribbons that anybody…in my room. So when Carolyn crawled into bed with a good book, and Denise dragged her hubby off to Karaoke, I went party hopping. Oh-oh…there’s the golden lasso. I swear this blog is all true… Alright! Alright! Mostly true. 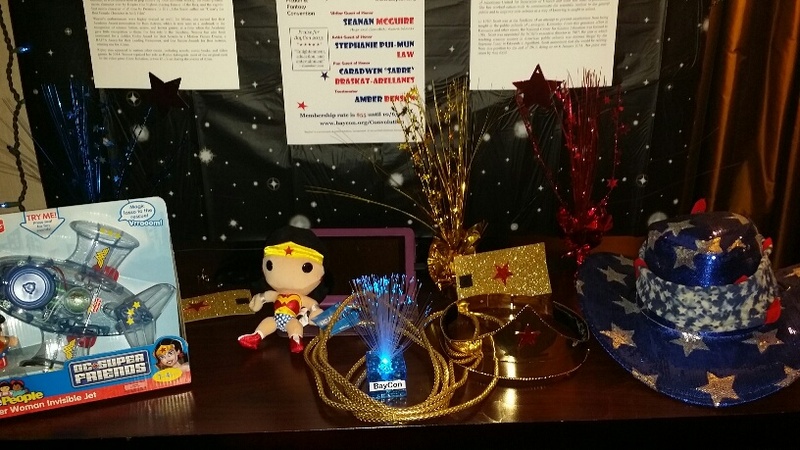 I went to the party floor and started with the Wonder Woman party. I got a stamp. No ribbon. I hit a couple of more…again, stamps, but no ribbons. I didn’t know what these stamps were for but as I progressed I feared I might wind up looking more tattooed than beribboned…and I wasn’t out to win the tattoo contest! Finally I asked, “Why am I getting these?” Turns out it was so I could imbibe the alcohol. Well shoot, I didn’t want alcohol…I wanted ribbons! So that ended my tattooing for the evening. 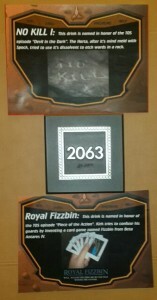 Hey look at these cool flyers outside the Star Trek party! Oh wait, what are you–Well they didn’t last long. I finally get to the Star Trek party…yep, you can always tell. Every Star Trek party I’ve ever seen has Klingons hanging out by the front door. These two were uncharacteristically friendly…maybe I should have gotten the tattoo at this stop and gotten happy too! But I was too distracted…they had RIBBONS! Just inside the dark fabric-draped party room were a couple of folk who claimed to have ribbons, which apparently were in this man’s pocket, behind the wad of cash that was pulled out entirely by accident, or so was claimed…Hey this ain’t Vegas, babe. What happen’s at Con-Volution, plays at Con-Volution…and all over the Internet! 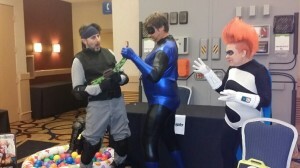 What happens at Con-Volution doesn’t necessarily stay there! And I did. 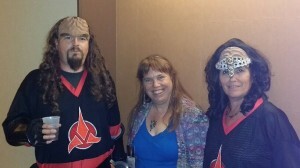 I hung out with the Klingon’s at the door. So long as the Klingons are happy, a well-lit hall amids these warrior folk is a nice safe place to be. Oh My! Yes, make me your slave! This is an important consideration. The con was a dangerous place. 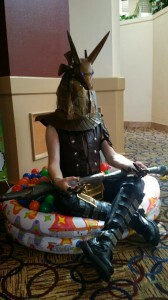 The system lords were about, no doubt enslaving fellow con goers. Dear Ms. Blue Conquering Alien, Thank you for returning Carolyn to us. She is recovering nicely. 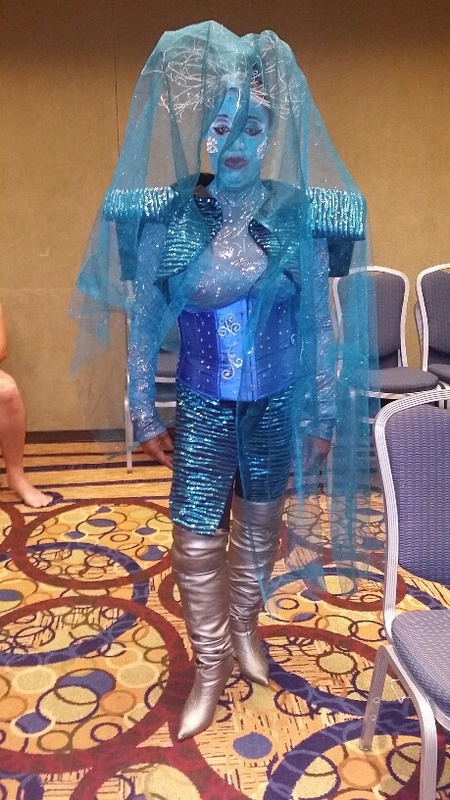 Apparently the same goal for this blue alien, who on Saturday carried off my roommate Carolyn, never to be seen again…until after the masquerade. The alien enslaved Carolyn to do unspeakable acts to her most alien body. For several hours, Carolyn had to paste tiny little lights all over the alien’s blue skin. Oh, the horror! But Ms. Blue certainly looked smashing on the stage all lit up! Move along everyone…nothing to see here, just your average maniac robot collecting body parts for his evil pet project. 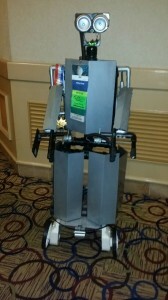 If slavery isn’t horrific enough, this robot nearly had me as I wandered the halls. Looking for brains and body parts in its quest to become a cyborg. You can’t see me ’cause I’m hiding behind my Con-Volution swag bag. Hey, I got an extra ribbon for doing this! But even as I hid, I was in fear for my life as laser bullets flew rampant over my head…Until this guy in blue and his Incredible red-headed partner disabled the gun in a pitched battle. See how well the camo pit is working? You can’t even see me hiding! Safe at last up here on the party floor in the company of happy Klingons…until the Men in Black appeared.